There was some pretty cool stuff that happened this past weekend at the SCG Dallas Open. The winner, Peter Hollman, put Four-Color Death’s Shadow and Tarmogoyf back on the map. 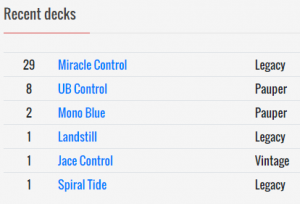 And the runner-up, Ian Thorne, along with well-known players like Zac Elsik and Pieter Tubergen, proved Creeping Chill is the real deal in Modern Dredge. We also saw Evart Moughon showcase some creativity with Arclight Phoenix—which I mentioned in article #14—outside of Standard, taking it to a 16th place finish with his Izzet Spells deck. 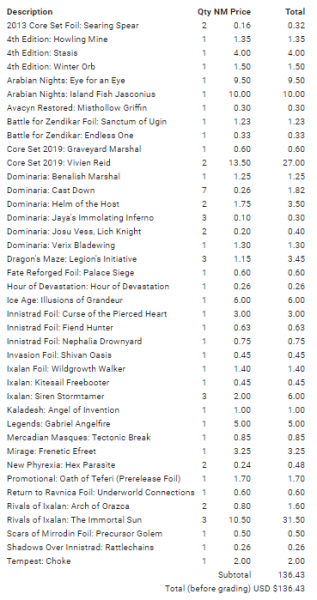 And Zan Syed took Humans to another level by putting Tormod’s Crypt in the sideboard, as he and others expected Dredge to show up in numbers at the tournament. It was a good prediction. Meanwhile, Standard has still been a little stagnant, with Golgari decks continuing to beat up the field. But as always, the need to stay ahead of the metagame exists. I mentioned this as a Fold in article #15. Was I correct with my prediction in the uptick of Dredge in Modern? Yes. Was I took quick to sell these? Maybe. Is it wrong to lock in some profit? No. These have spiked to about $10-12 now. If you have these and aren’t using them, you might as well sell into the hype and get them again if you need them when they’re reprinted. This was also mentioned as a Fold in article #15. I stuck to my word and sold a couple of extra sets I had lying around, as this will probably never see play outside of Standard. Here’s a buylist order I placed with Card Kingdom on Sunday, October 21. Some of these cards weren’t in near mint condition so the total will definitely be less than $136. But a lot of those cards have been rotting in my trade binder and boxes in a closet, so I decided to get rid of them to turn the cash into something more useful. I didn’t want to go through the hassle of trying to sell these cards on eBay, TCGplayer, or Facebook. I went with Card Kingdom, which, from my experience, has been a decent place to buylist cards. I picked up a set of these because the Standard Mono-Blue deck might have some legs. 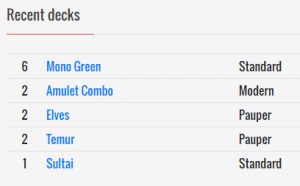 Take a look at Crash_CZ’s 5-0 list from Magic Online. And although Travis Woo is banned, he still plays online and posts stuff in the Magic for Good Facebook group, including a recent post featuring this same list. This list also includes Disdainful Stroke in the sideboard, which was mentioned in article #11. And worst-case scenario I can buylist them to Card Kingdom for $2.50 cash or $3.25 store credit if I decide not to use them. $5.99 is a pretty high entry point, but I didn’t have a playset yet so I bought one just to have it. As I already mentioned above, the card is definitely the real deal. So having a playset of these if you want to play Dredge isn’t too bad. However, with that said, it really only goes in Dredge right now. Thus, I don’t know how much higher this can go. If you need or want them, get them as they’ll probably hold value for quite a while. If you don’t need or want them, sell into the hype just like with Shriekhorn foils. The Mono-Blue list posted above has been running 1-2 Sentinel Totem in the sideboard. It also shows up once in a while in Mono-Red and Boros lists. At the very least, it’s an option for any deck to deal with pesky cards like Rekindling Phoenix, Arclight Phoenix, jump-start cards, and Golgari decks that utilize the graveyard. Also mentioned above, was Zan Syed’s innovation to add Tormod’s Crypt to his Modern Humans deck to combat Dredge and other decks that abuse the graveyard like Storm, Living End, and Control. Now, is the scry 1 good enough to warrant playing Sentinel Totem at the cost of an extra generic mana and exiling both graveyards? I highly doubt it. But maybe I’m wrong. With that said, $0.99 is pretty cheap for a card that can slot into pretty much any deck’s sideboard. Corbin Hosler recently wrote on TCGplayer about Nikachu’s Merfolk deck that he’s been doing decent with in Modern, which features Mistcaller instead of Cursecatcher. Granted, both of these players are diehard Merfolk fans, so I would proceed with a bit of caution here. However, that doesn’t mean the deck is terrible. As a matter of fact, as I take at the deck a little more, there’s actually a Wizards sub-theme in the deck. Something like Wizard’s Retort might be a better option than Deprive in the sideboard and might even be good enough to eventually make it into the maindeck, since both Merfolk Trickster and Aether Vial give you added flexibility. Does that also mean Harbinger of the Tides needs to make its way back into the deck? I’m not so sure yet. Anyhow, $2 for this Merfolk Wizard that could potentially become the go-to one-drop for the deck is relatively inexpensive. It seems like a pretty useful card compared to Cursecatcher with all the decks in Modern right now that are looking to cheat creatures into play from the graveyard like Dredge, Hollow One, Living End, and Bridgevine. And as a bonus, the Open House promo version of Silvergill Adept is also around $2. Gul_Dukat came in first place of the Magic Online Legacy Challenge on October 22. If you look a bit closer, there are four other Miracles players that also ran a playset of Accumulated Knowledge in their lists. It sure looks like Miracles is on the rise again, even without Sensei’s Divining Top. But be careful, as demand from one deck in Legacy alone won’t cut it. However, Accumulated Knowledge also pops up in the occasional Landstill and High Tide decks. There’s a small chance the popularity of the card in Miracles will spark more interest to play the card, since it looks at both graveyards and pitches to Force of Will. The other thing to notice is that it also sees play in blue Pauper decks. The Masters 25 foils are pretty cheap compared to the Nemesis foils and FNM promos which all have the same artwork, so there’s potential for this version to spike a little bit. This one is a bit tough because there are five foil versions with two of them being promos. But the main thing is that this card is starting to see more play in Modern alongside Arclight Phoenix and Runaway Steam-Kin thanks to Faithless Looting, a.k.a. the red Brainstorm as Ben Friedman has once said. Check out MentalMisstep’s Phoenix Burn deck. This has been showing up in the sideboard in a lot of the mono-colored decks in Standard. Supply seems pretty low on TCGplayer too. Sadly though, I don’t think this will see play in Modern or Eternal. This card, however, is starting to see play outside of Standard. 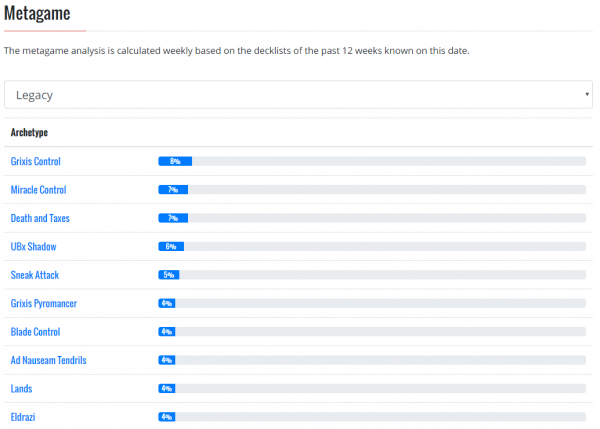 Take a look at this short list of decks, which could grow over time. It’s a one-drop that does a decent job at making sure you hit your land drops early, while mitigating flood and digging for your powerful threats. This card has been printed into oblivion since we first saw it in Alpha. But this is probably one of the coolest promo versions that Wizards has printed. This has been out for a few months now, so I don’t see this going too much lower. And even if it does, I doubt it will ever drop past $5. On the flip side, I see this slowly increasing in value over time and never looking back. This just rotated out of Standard and hasn’t seen a whole lot of play in Modern or Legacy yet. But that could change over time since it’s a one-drop with prowess which plays nicely with the cheap, powerful spells in both of those formats. I would keep an eye on this one. If the price drops to $2-3, I would definitely pick up a few playsets. Here’s another interesting card. This has steadily risen over time but I’m not really sure where demand has been coming from prior to something like Runaway Steam-Kin. And even then, I haven’t seen it in a list with the two cards together. However, I could see an updated Mono-Red Runaway list with Mass Hysteria, Insolent Neonate, and Empty the Warrens joining the party. But that’s just a brewer’s idea for now. I’ll be co-hosting Quiet Speculation’s Office Hours again. This will be the second time. You can catch the audio of the inaugural session with Sigmund Ausfresser and me here in case you missed it. Christopher Martin will be joining me for the second session. It’s set for today at 8pm Central, so mark your calendars and join us in the Discord channel. I didn’t want to deal with multiple buylist channels and packages/costs. This is probably something I’ll revisit and talk about in a future article regarding issues like utilizing Quiet Speculation’s Trader Tools to find the highest buylist prices and dealing with buylisting/selling through multiple channels instead of using one all in one shot. Adventurous Impulse is almost strictly worse than Oath of Nissa in eternal formats, and with how little Pauper play it sees, I don’t see it going up much in price. You’re right. I wonder why something like Amulet Titan uses Adventurous Impulse over Oath of Nissa.